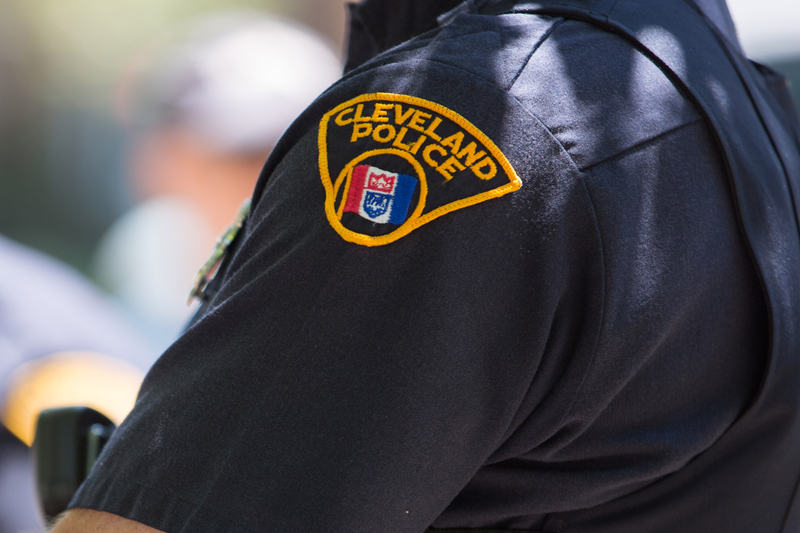 A Cuyahoga County judge on Saturday handed lawyers for police officer Michael Brelo a verdict of not guilty for his part in the shooting deaths of Timothy Russell and Malissa Williams, two unarmed black citizens who had been flagged down after an intense car chase in 2012. Immediately following the verdict, swarms of peaceful protesters climbed the steps of the city's Justice Center Complex, expressing their dismay at what they believed was a broken system. At a press conference shortly after the trial was concluded, the families of the victims called for peace. "To be quite frank ... I did not believe that Brelo was going to be [found guilty] of manslaughter," said Russell's sister Michelle. "But I did expect that he would held accountable to some level — there was even some testimony from other officers that felt that [what he did] was wrong." She added that it was "outside of her brother's character" to be a violent person and that she had hoped the police would have taken that into consideration. But regardless of her disappointment, Michelle also explained that she "was not for" any angry looting or criminal behavior from those who disagreed with Judge John P. O'Donnell's ruling. "I don't want people to be burning down buildings, or rioting, or hurting anybody," she told reporters. "As a community, we have to come together and use wisdom and knowledge — we have to organize to try and come up with a way to stop this from ever happening again." In earlier court documents, both Russell and Williams had been portrayed as troubled drug addicts living on the streets of Cleveland. Williams, 30, had been living at the Norma Herr Women's Center on the North side's Payne Avenue prior to her death, records showed, and authorities indicated that her longstanding mental health and drug issues had led to around 33 run-ins with the law over the past decade and a half. As a child, officials believe Malissa Williams may have suffered abuse, as indicated by a court report by attorneys Kevin Cafferkey and Walter Camino, who defended her sister Tiani before she was sentenced to life in prison for killing her boyfriend in 2009. According to similar filings, authorities indicated that Russell, 43, had also struggled with drug problems and had a record peppered with incidents of trespassing, petty theft, domestic violence, and aggravated robbery. He had been living in the Metropolitan Ministry shelter on Lakeside Avenue, apart from his teenage son, up until two days prior to death when he was transferred to transitional housing. On the night of the police shoot-out, authorities stated that Williams and Russell had met up at the Bishop Cosgrove Center to receive free meals. Witnesses later testified that the two had left together to obtain drugs. After being spotted by a plainclothes officer on Lakeside Avenue in a 1979 Chevy Malibu, Michael Brelo was called on to run their plates and, when the results came back clean, he attempted to pull them over for a turn-signal infraction. It was at that point that the two sped away, causing the car to backfire, which officers testified they believed at the time was gunfire. After finally forcing them to pull over following a high speed car chase, officers opened fire. Crime scene investigators testified that over 137 bullets had been fired that night and that Brelo alone had climbed atop the hood of the Chevy Malibu and fired into the windshield a total of 15 times; prosecutors later said that they considered the action "excessive" as neither Williams nor Russell were considered a threat at that point. On Saturday afternoon, following Judge O'Donnell's ruling, Williams' brother Alfredo spoke out, telling Fox affiliate WJW that he thought Brelo should have gone to jail for his part in Malissa Williams' death. "This was straight murder," he told a WJW reporter outside the courthouse. "What happened to my sister ... she's gone now, she's dead." The reporter pushed again, asking whether he thought the protests in his sister's name were the right reaction. "This is absolutely the right thing — I'm calling for change," he said. "I'm hurting, and she's gone... and I can't talk to her [anymore] — it's over."